My friend Jeanne who is better known as Cook Sister! recently was a key note speaker at the Food Bloggers Indaba and in her talk she recommended we submit our pasta recipes to Presto Pasta Nights. This was a natural and perfect suggestion for me, as my friend Cindy had coined “Tandy Tuesday’s” a while back to cover my challenge to make a pasta dish with only 5 ingredients. This is the basis for my weekly pasta dish and I am so glad that there is a whole world out there of people who love making pasta dishes. Pasta is a staple meal in our house and usually we eat pasta on a Friday night. I get home late, and this is the easiest meal to prepare. Any pasta dish can be made in half an hour and does not need constant attention. This is perfect for a family meal, or a meal for one. I recommend always making left overs so that you have lunch for the next day to look forward to. Two of my very favorite vegetables, with chorizo and wine, what a Dish! Sounds really good. Thanks so much for sharing with Presto Pasta Nights. I’m thrilled that Jeanne mentioned it at the conference. And always thrilled to have you share a dish with PPN. This one looks amazing. I take it that you used canned artichokes or did you manage to find some fresh ones? I’ve been using light cream cheese as an alternative to cream in my pasta dishes for a long time now…and this recipw would suit me fine! All ingredients delicious! What a brilliant pasta dish! Never thought of using asparagus and artichokes in pasta before – YUMMY! 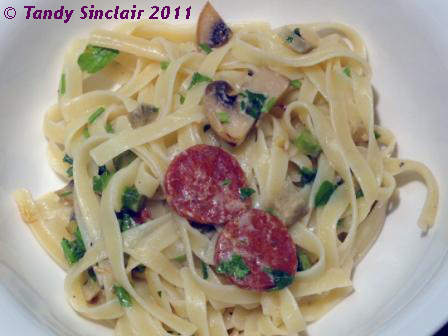 I am a devout addict of artichokes and asparagus – and the thought of them married together, with chorizo and pasta, sends me into happy heaven!